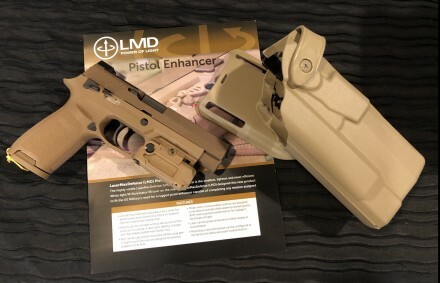 When we showed the new Pistol Aiming Light (PAiL) by LaserMax Defense for the M17/18 Modular Handgun System, there was a lot of concern about there not being a holster for the PAiL equipped pistol. Since the US military plans on buying pistols in the tens of thousands per year and each will be equipped with a holster, this really wasn’t the disaster so many made it out to be. Of course, the Army and industry have already developed a solution. This is a first look at what will become the new holster for MHS. Because the basis of issue for MHS goes all the way down to Squad Leaders, and the PAiL will go on pistols issued to all Close Combat Forces, this PAiL compatible holster will become the standard Army holster.